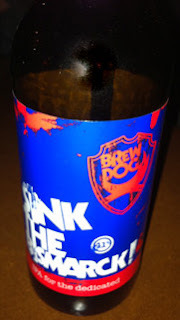 Ales From The Crypt: BrewDog - Sink the Bismarck! BrewDog - Sink the Bismarck! Fruity sweet with heavy malt smell and some slightly acrid scents. Slightly detectable "legs" of lacing on the glass. Taste is deep smoky like the that of burning rubber. Lots of biting hops throughout. Warms the back of the mouth and throat; quite a bit of alcohol sting. Tastes intensified as it warmed to room temperature. Heavy malted body, complex flavors. Sink the Bismarck! is beer, amplified. With the volume turned full up, it is important you that you be careful with this beer and show it the same amount of skeptical, tentative respect you would show an international chess superstar, clown or gypsy. Sink the Bismarck is a quadruple IPA that contains four times the hops, four times the bitterness and frozen four times to create at a staggering 41% ABV. This is IPA amplified, the most evocative style of the craft beer resistance with the volume cranked off the scale. Kettle hopped, dry hopped then freeze hopped for a deep fruit, resinous and spicy aroma. A full out attack on your taste-buds ensues as the incredibly smooth liquid delivers a crescendo of malt, sweet honey, hop oils and a torpedo of hop bitterness which lasts and lasts. I got a burnt rubber like taste, not entirely detestable, but certainly not a drink to be quaffed in any kind of quantity. BrewDog duked it out with Schorschbrau in the strongest beer "arms race" for ABV supremacy. This was BrewDog's second salvo fired at the "sausage-muncher's" attempt to dethrone them for the crown. Sink the Bismarck! is one heck of an alcoholic concoction, but certainly it seems aimed at grabbing some headlines, and $$$ rather than a serious, drinkable beer. That aside, it is still fun to watch these two brewers from the sidelines. Even more fun, is the chance to get a taste of this rare, and extreme example of brewing. And taste, I did, since it won't likely pass this way again. Thanks to the fellow who brought it with them to this year's Beer Blogger's Conference, else I might not had a chance to sample it, at all. Just like the real battle ship, it was very tough to sink, indeed!